Like most people, the item at the top of my winter to-do list is staying healthy. Of course, avoiding seasonal flu is easier said than done when chilly weather forces us indoors where germs abound. Aside from washing hands and getting sufficient rest, keeping yourself well fed with nutritious foods can keep sickness at bay. 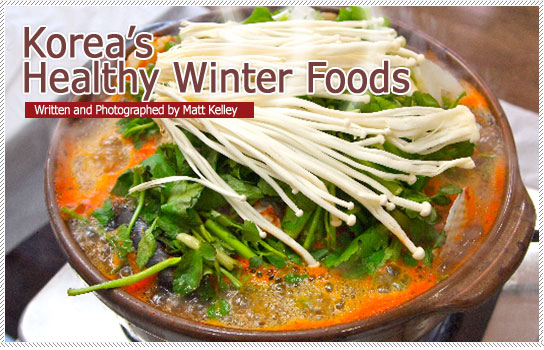 In much of the world, winter is about staying warm with piping hot soups and beverages. Korea certainly experiences a robust winter of chapping winds, cold temperatures and shrinking hours of daylight. Despite this, in Korea, hot soups are associated with summer heat, where “fighting fire with fire” is a hot weather tradition. Nevertheless, the Korean kitchen is full of hearty soups and stews, traditional porridges and medicinal teas, all perfect options to help keep you warm and healthy this winter. To give you a “taste” of what’s on offer, here’s a quick review. Soup figures prominently in the Korean diet. Served with virtually every meal, its ubiquity has spawned diversity. The perfect meal on a snowy afternoon is Gamjatang. The so-called “potato soup” is better known for its succulent pieces of pork, which are boiled (typically at your table) with sesame leaves, spinach, green onions, enoki mushrooms, spices and, yes, the occasional potato. As a peninsula, seafood soups also figure prominently in Korea. From the hot and spicy seafood smorgasbord called Haemultang, to the freshwater shrimp soup, Minmulsaewootang, and marsh clam soup, Jaecheopguk, Korea’s seafood soups are a fantastic alternative to land-based meats. If you crave some land fowl, however, your best bet is Samgyetang, a soup made from a whole young chicken stuffed with glutinous rice and boiled in a ginseng broth. Beyond its lovely taste, Samgyetang is fun to eat. As your spoon emerges from the earthenware bowl, it’s a guessing game to discover what emerges. Will it be a clove of garlic or a gingko nut? A cracked walnut or dried jujube? Traditionally eaten on “Sambok,” the three hottest days of the year, the wholesome soup is said to protect the body and restore energy. Not to be missed, beef is another staple of Korean soups. The sister soups of Gomtang (beef brisket and tripe soup) and Seolleongtang (ox bone soup) are two popular options that claim to buoy one’s health. Seolleongtang is a widely loved winter soup. Made from ox leg bones simmered for eight hours or more, the milky white broth is seasoned by the customer with coarse salt, green onions or chili pepper powder. Some restaurants will serve it with wheat or sweet potato noodles, while most customers tip their tin of rice into the broth, mix, and enjoy. Finally, as you’ve probably noticed, many Korean soups end with “tang,” but another common suffix is “guk,” as in Tteokguk. This soup actually is associated with winter, since it’s typically enjoyed on New Year’s Day. The chewy sliced rice cakes, called “tteok” in Korean, are said to resemble coins, thus ensuring a healthy and prosperous year to come. Perhaps you still can’t tell your “guk” from your “tang?” Nevertheless, we’re going to throw more into the pot, if you will. “Jjigae” and “jjim” are two Korean types of stew. Distinguishing soup from stew is more art than science, but the latter usually refers to a dish where the broth has reduced significantly and the other ingredients dominate. Two of the nation’s most popular stews are Kimchi jjigae (spicy pickled cabbage stew) and Doenjang jjigae (soybean paste stew). While it takes some people a while to fully appreciate doenjang (think of miso soup with a lot more character), the fermented soybean is a staple in Korean cuisine. During the fermentation process, the liquid form becomes soy sauce while the solid is crushed into paste. When added to an anchovy stock, hot pepper paste, vegetables, garlic and thick slabs of tofu, the result is a delicious and pungent stew. Korea’s best soybean paste is said to come from Sunchang County. The tiny hamlet of North Jeolla Province also boasts the nation’s highest proportion of residents over age 85. Since Doenjang is packed with essential amino acids, vitamins and antioxidants, perhaps it’s more than just a coincidence? Similar to jjigae, jjim is made by steaming or boiling marinated meat until the liquid is reduced even further. Examples of regional jjim include Andong’s Jjimdak steamed chicken and Masan’s Agujjim, a mix of anglerfish, sea squirt and soybean sprouts. My personal favorite is the sweet and spicy Galbijjim. The delectable dish’s beef short ribs are cooked over low heat with chef’s choice of vegetables, cellophane noodles, rice cakes and sometimes even a quail’s egg. In the unlikely event that you tire of Korea’s vast selection of soups and stews, another option that’s sure to warm your gullet is the traditional porridge, called juk. Made from boiled rice at about a 1:6 rice-to-water ratio, variations on the soup are popular from Sri Lanka to China, where it’s known as congee. Frequently advertised as a health food, juk is often served to the very old, very young and infirmed, since it is mild and easily digested. Korean juk comes in dozens of varieties, with vegetable and seafood porridge among the most common. Bean sprout, pumpkin, oyster and pollack are other options. Jeonbokjuk, an abalone gruel mixed with small pieces of carrot and green onion, is another favorite. If you’d like to spice up your gruel, add ground nuts or dried seaweed. Although the colorful seafood options are winter mainstays, my cold weather choice is the red bean porridge called patjuk. Red beans have a subtle flavor and are packed with fiber, protein and vitamins. Plus, frequently hiding beneath the purple surface are chewy balls of rice called birds’ eggs. Often eaten on Dongji, or the winter solstice, the vaguely red hue is said to bring good fortune and dispel evil spirits on the shortest day of the year. Finally, traditional tea has a long history in Korea. It’s been said that a tea offering was made to the spirit of King Suro some 1,300 years ago during the ancient kingdom of Gaya. Although daily tea ceremonies among the royals and aristocrats waned during the Joseon Dynasty (1394-1910), wild tea plants have grown continuously for centuries on Korea’s southern foothills, and today, tea represents a major regional export. Although tea comes in many types and colors, all tea originates from the same plant. Despite their common source, certain preparations are prized for their well-documented health benefits. For example, in addition to green tea, Yujacha (citron tea), Saenggangcha (ginger tea) and Ssanghwacha (harmonized energy tea) are frequently consumed as home cold remedies in Korea. Furthermore, tea served with locally harvested honey can relieve allergies, sore throats and coughing. The next time the cold weather drives you indoors, rest assured there are plenty of hot soups, stews and other treats dedicated to keeping you healthy. As you wrap up this year and plan for the next, just remember: Don’t work too hard, get plenty of sleep, and take time out to relish some of the delicious and nutritious staples of Korean cuisine.